Discover the most exciting fishing experiences in the world. Ultimate Fishing Adventures takes you on a remarkable journey visiting 100 destinations from Alaska to New Zealand. There’s every sort of angling from the grace of fly-fishing to epic offshore battles. Remarkable full-page images bring each fishing adventure to life in this stunning coffee-table book. Written to inspire and excite – though there’s plenty of information on the fish you’ll find and the best way to catch them. Turn the pages to go on a voyage of discovery from secret African rivers to idyllic tropical islands. Fight with monsters of the deep in Australia or get set for superb sport in the USA. There’s plenty to delight and excite in and around Britain and Europe. 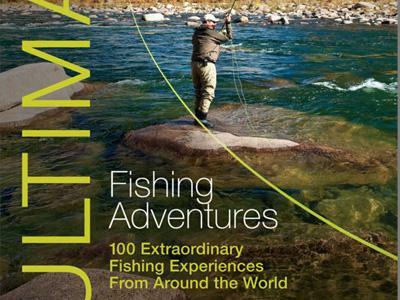 Anglers of all sorts will treasure this inspirational collection of the world’s most exceptional fishing adventures. This is a must for anyone who loves to fish. Henry Gilbey is a fishing writer, photographer, TV presenter and consultant. Henry photographs all kinds of fishing from all around the world. He writes and photographs for numerous publications including The Field, Sea Angler, Trout Fisherman, The Times and Trout and Salmon. He presents Wild Fishing and Fishing on the Edge on the Discovery Channel. The first thing that smacks you right between the eyes when you pick up Ultimate Fishing Adventures are the visuals. It is a glorious book to look at thanks to the extremely high quality of photography used. This has been largely contributed by Gilbey himself of course but with a sprinkling of others nicely attributed under the picture credits at the back of the book. Each location featured either uses a full-page image or a double-page spread which helps to illustrate what to expect, whether they are fish portraits, action shots or landscapes. In some ways it is actually a shame there is only the one image used as you just know there must have been so many great shots to choose from but it certainly fills the book with drama on every page. The choice of locations is interesting and obviously very personal. 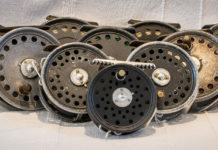 Some you would expect as they are so well known like Atlantic salmon fishing on the Miramichi in Canada or flats fishing on the Yucatan Peninsula in Mexico, but there are a great many others that will either be completely unknown to the reader or at best just distant rumours heard on the grapevine. There are choices located on (and far offshore from) all the major continents and they cover a huge array of fishing adventures and locations from the exotic like the beautiful Seychelles and Bahamas to the stark beauty of destinations like Mongolia and Greenland. Whether you are a trout bum, salmon junkie, steelhead nut, flats walker or a big-game bluewater buff you will find a choice of adventures to explore. The accompanying text acts as an overview of the destination and fishing adventure you can expect. As each location/adventure covers 2 pages each, and with the photography taking up a lot of that real estate already, space does not allow it to be overly detailed but I found it enough to give me what I would need to know to decide whether I then wanted to research a location further. There is also a small sidebar on each adventure giving the location on a map and a few very short notes on “Best times to fish”, “Fishing methods”, “Getting there” and “Tips and Tricks”. These I did feel were too brief on occasion and left a lot of empty column space that could have been better used. Overall that is a very minor niggle though in what is overall a wonderful book that any adventurous angler will enjoy dipping in to and even non-fishers will not fail to be mesmerized by the beautiful and top-class images which shows the lengths and places we will go to as anglers to satisfy our passion. A great gift for Christmas or as an addition to your own fishing library.